We are in Prague! Well, I was more or less 2 weeks ago. Arrived at the airport we looked and looked and looked and, guess what?, looked again for our name on a piece of paper hold by the guy of the shuttle service sent from our hotel but we couldn’t find any. Too bad, we took one of those taxi-vans that can fit up to 8 people and we even spent less than thought. The ride was great! It was such a warm day, too warm probably. The land on which Prague was built is quite varied (it goes from 100/328 to 400/1312 m/ft above the sea level) and the airport is built on the highest plateau. The taxi brought us trough a bit of the countryside and near what seemed to be a lonely McDonald standing in a desert road. At a closer looks we noticed few people with beach-towels. Most probably behind the McDo there was a lake of which we could perceive part of the surrounding wall: a nice cut in the bare rock otherwise covered with luscious green vegetation. Traveling downhill, we started seeing villas that once should have been almost in the countryside; the German architectonic heritage was evident in some of them. All of a sudden, tourism buses appear to queue on the right side of the road; we later understood that that was the location of the famous Castle of Prague. Going still downhill through almost now desertic streets (did I mention already that it was a Sunday? ), we reached the Vltava/Moldava river. We crossed it on one of its Art Nouveau bridges that brought us directly into the heart of the city: the Old Town Square (astronomical clock anyone? ). We got even a tour through the old city included with the taxi ticket, yuppie!! Gosh, is Prague beautiful or what? Not always suited for car travels though, some streets have tiny steps along them for instance. Long story short, we reached our hotel in Wenceslas Square (mommy unfortunately tripped over getting down from the high van, thankfully without serious wounds). More than a hotel our was a residence. Each room had its fully equipped kitchen (when I say fully I mean even with a dishwasher! ), a nice lounge/eating section and the beds. Yeah, we got even a bathroom, just if you doubted it. After a short digestive nap, we headed toward the town. Wenceslas square is quite emblematic for the city of Prague; the perfect balance of very different architectural styles spanning more than half a century. You have got stunning Art Nouveau buildings standing aside of Deco and 40’s style ones and just in front of them a modern glass building: how cool is that?? There seemed to be a sort of festival that Sunday in the city and a bunch of youngsters were playing basket in part of the square while somebody was yelling what seemed to be rap music. Anyway, we decided to cross the glass building and explore a bit. We ended up walking toward the National Theatre of Prague. The walk wasn’t boring at all. 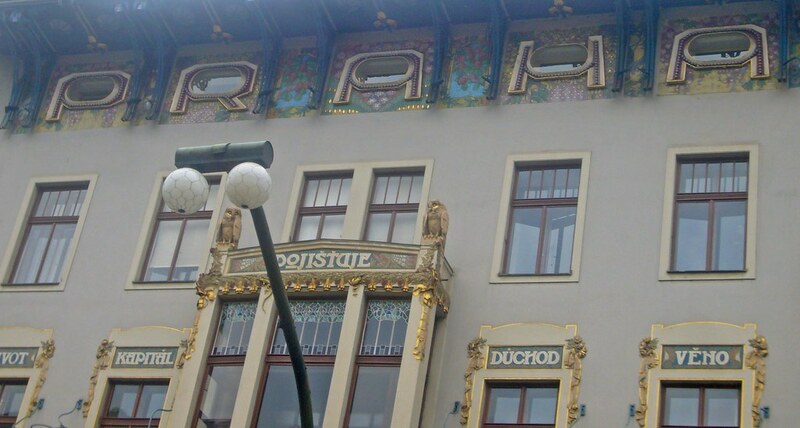 Stunning Art Nouveau buildings were just beside us shining in all their majesty: some of them were gorgeous (one even had the uppermost row of windows encased in the word “PRAHA”). Once we reached the riverside, we sat down for a while to rest and admire the view of the hill facing us (did you know that they have a sort of scaled down copy of the Eiffel Tower up there?). The most stunning view was actually that of the thunders striking against the same hill. Yeah, the weather was changing (thankfully, we could say). We decided to look for a cafe to repair from the coming storm, so we headed again toward the city but this time along the riverside. We had our first peek at St. Charles bridge, filled up with tourist as ever and also by a huge construction site taking almost 2/3 of its width and going all along it. Once reached the bridge and turned right, we were again into the old city (did anyone say tourists?). By now, it had started drizzling; kinda painful raindrops though so we rushed looking for a nice cafe. Fortunately we found the “Per Lei Cafe”. A pretty nice cafe with walls painted either in horizontal stripes of burgundy and silver or displaying huge colourful Iris flowers. Pretty charming atmosphere, the coffee was nice too, the ice-cream bowls ok (I cannot really stand canned whipped cream). I think we sat there for a good hour while waiting for the rain to stop and watching the people passing by trying to avoid the puddles the rain had formed. When we left the cafe, it was almost dinnertime so we decided to go toward the Old Town Square and have a look at its clock and the surrounding architecture while looking for a restaurant. Walking up and down I spotted what seemed to be a fine looking French restaurant, the “Zlatý Hrozen” (Gold Grape). The menu seemed interesting so we decided to give it a shot. The room was quite small with creamy-yellow walls and dark wood furniture (there was also a room downstairs). The waiter welcomed us very warmly and sat us down. The printed menu had a bit of the history of the restaurant so we learned that we were in a building that hosted restaurant like activities since the 17th century, even though it was much older. The actual restaurant is opened since 1992, a pretty long history that reassured me of the choice. • Double consommé with Sherry: loved the aroma of the sherry but it was far too salty (double does not mean with double stock powder). 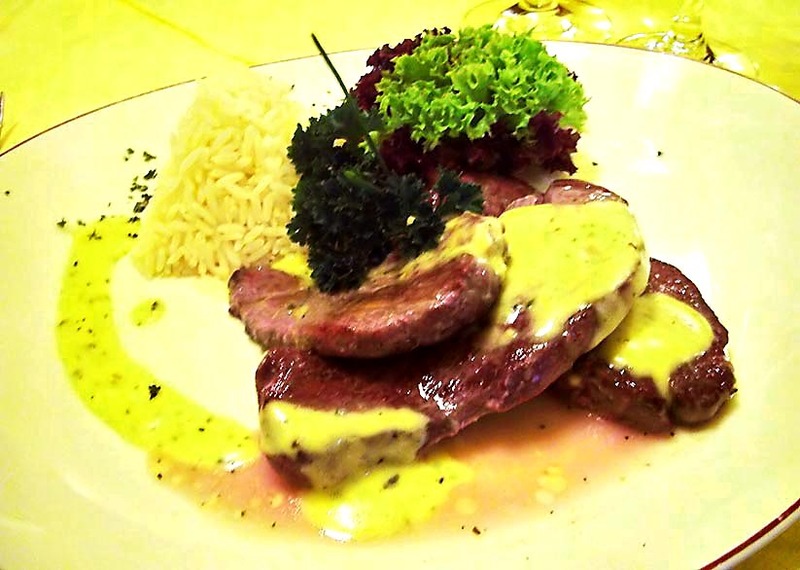 • Grilled ostrich steaks with Béarnaise sauce: the meat was OK probably slightly overcooked; the sauce was too thick and bland (my mother and sis recognized the taste of egg yolks, probably because they don’t like it) the tarragon was just a decoration. As starch the dish featured some rice that to be optimistic was a parboiled one, anyhow it was as gummy as gummy-bears. • Strudel: was OK, a bit dry and the cream was the one from the pressured bottle. • Tiramisu (taken by sis): was NOT a tiramisu. Best calling it an iced plank of biscuits and sugary coffee scented syrup with sort of cream topping; worthless to say that my sis was quite disappointed. • Doughnuts filled with vanilla cream (taken by mommy): looking pretty but still fridge cold on the inside. The wine was quite nice as the service though. The espresso was pretty good too. All considered, I do not feel like recommending this restaurant, at least in the summer season. Time to go home! On the way back we had another brilliant example of Prague eclecticism: a what looked like the exterior of a high Gothic chapel (embedded in a more recent building) was side by side with the neoclassic theatre (Estates Theatre) that hosted the première of Mozart’s “Don Giovanni”. Gorgeous coup d’oeil! The theatre was painted in light green with white Corinthian columns and lesenas with golden capitals. From there, in a blink of an eye, we were in our rooms ready for a night of sound sleep. Stay tuned for more on our trip, still 2 full days to go!